"An era of cheap food has come to an end. A combination of factors -- rising demand in India and China, a dietary shift away from cereals towards meat and vegetables, the increasing use of maize as a fuel, and developments outside agriculture, such as the fall in the dollar -- have brought to a close a period starting in the early 1970s in which the real price of staple crops (rice, wheat and maize) fell year after year. This has come as a shock. By the 1990s most agricultural problems seemed to have been solved. Yields were rising, pests appeared under control and fertilisers were replenishing tired soil. The exciting areas of research in life sciences were no longer plants but things like HIV/AIDS. The end of the era of cheap food has coincided with growing concern about the prospects of feeding the world. Around the turn of 2011-12 the global population is forecast to rise to 7 billion, stirring Malthusian fears. The price rises have once again plunged into poverty millions of people who spend more than half their income on food. The numbers of those below the poverty level of $1.25 a day, which had been falling consistently in the 1990s, rose sharply in 2007-08. 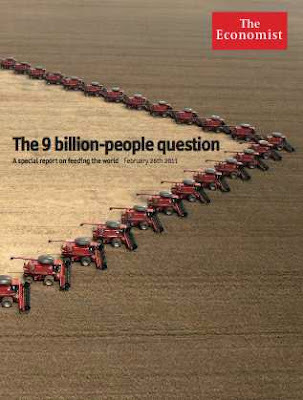 That seems to suggest that the world cannot even feed its current population, let alone the 9 billion expected by 2050. Adding further to the concerns is climate change, of which agriculture is both cause and victim. So how will the world cope in the next four decades?"